Family ski vacations are very popular and understandably so. Imagine spending the whole day outdoors with your kids, all of you enjoying participating together in physical activity. Imagine how nice your meal will taste after working up your appetite. Imagine relaxing and socializing with your family and friends at the end of the day. Imagine all the memories you and your kids will have of this valuable time in their lives. Why Are Family Ski Vacations So Popular? 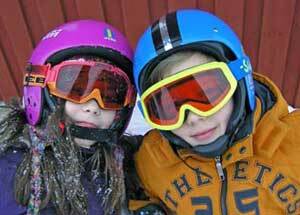 Most children love active holidays and there are few holidays more active than a skiing vacation. Many parents love active holidays as well so family ski vacations are great holiday option for active families. Children tend to be very good at skiing and the younger they start the better. Many parents see family ski vacation as investing in healthy outdoor sport that their children can enjoy for the rest of their life. Skiing is a physical activity that children and parents can enjoy equally as it does not matter how good you are at skiing... everyone can enjoy skiing at his or her own level. The grandparents might enjoy it too. Skiing vacations offer relaxed and social atmosphere that all family members tend to enjoy. Often friends or siblings take their families together on a skiing holiday, making the skiing even more of a social event. The ultimate family ski vacation includes grandparents, their children and grandchildren. Firstly, make sure the slopes are suitable for your children's age and ability. They should be not too challenging but still challenging enough. The best ski resorts offer wide range of slopes so all levels of skiers will find something suitable. Look for nursery ski area and ski kindergartens for the youngest ones and appropriate ski schools for other family members (if needed). Most ski resorts take children into ski schools as soon as they are potty trained. You should also check what child friendly après-ski activities are available. You might be exhausted after whole day skiing but your kids might still be full of energy. They (and you) might love a dip in the swimming pool after long day on the slopes or enjoy seeing the latest blockbuster in the local cinema. Alternatively, they might like to swap their skis for skates for half a day. If you are travelling with teenagers then make sure there are suitable après-ski activities for them on offer, as well as for the adults in the group. If you are planning to take a day off from skiing, then you might want to consider what else is on offer in the area, e.g. shops, museums, day excursions, etc. This is also important if there is a non-skier in your family. Make sure there are suitable activities on offer for them, e.g. walking trails, health clubs, cookery courses, etc. Children should wear proper ski clothes when skiing. Kids Ski Clothes keep them warm and dry when skiing, protect them from the elements and play an important role in protecting them if (when) they fall. The best ski resorts offer wide range of restaurants, bars and cafes to fulfill every taste and budget. However, if you and your family have any special dietary wishes or requirements then it is always good to check this out in advance. Depending on the age of your children it is always wise to consider the access to and from the ski resort. This is especially important when travelling with younger children, i.e. you might want to limit the transportation time as much as possible, look for direct flights and hotel close to the slopes. Do bring along age appropriate games and toys for your kids. Games that the whole family can enjoy are always great idea. Playing fun board game around the fire is a great way to relax after a good day skiing. Travel Games that do not require any toys might also be useful, especially on the way to your ski resort. There is no single best ski resort for family ski vacations, there are many excellent ski resorts for families. There are though some ski destinations that are more popular by families than others are. We will describe few of them to give you some ideas to start with. Europe and North America are very popular for family ski holidays, as they have been targeting families for a long time. However, you can find good family ski resorts in five continents (excluding Africa for now). Colorado family ski vacations have to be at the top of list and Copper Mountain is one of the best ski resorts in Colorado for families. Sun and snow is almost guaranteed from November to April. There are segregated family ski zones and miles of rolling beginner and intermediate slopes. There is excellent childcare available on and off the slopes and wide range of après-ski activities. 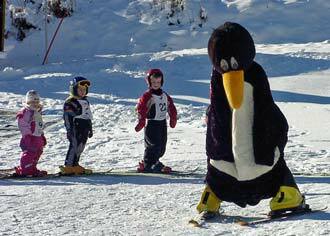 Colorado Family Ski Vacations are without a doubt one of the best ski resorts for family ski vacations in the world. Canada ski vacations are also popular with families and there are many great ski resorts for families to be found in the British Columbia, e.g. Big White and Whistler. Both offer excellent slopes and wide range of child friendly après-ski activities. There are many excellent European ski vacations on offer for families. Including number of great France ski vacation resorts and Flaine is widely considered one of the best ski resorts for families in Europe. Flaine is cozy, modern and car free resort. Everything is within a walking distance from your accommodation, shops, restaurants and the important ski lifts. Though small, there is lot to offer, not least to families. 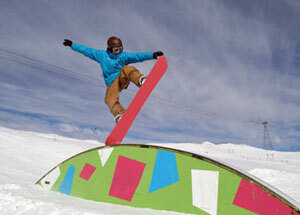 There are excellent ski slopes and all kind of activities for all ages on offer, e.g. snowpark, ice-rink, swimming pool, bowling lanes, cinema, climbing wall and even gallery and library. Flaine is one of the best France Ski Vacation for families. Andorra is one of the more affordable ski resorts in Europe and good choice for families and beginners. The biggest downside is the distance from the nearest airports but the facilities and price should make up for it. The best ski resorts can be very busy, not least during peak periods like school holidays, i.e. when most families go skiing. There are few travel tips that can help you to avoid the crowds as much as possible. If your children have not started school then go outside the school holidays or during weekdays. Skiing later in the season also means smaller crowds (and lower cost and more child friendly weather). Select ski resort that is further away from the nearest city / airport. Ski resort close to a city will attract local city dwellers and close to the airport appeals to skiers from abroad. Some slopes are also more popular than others are, as are some skiing amenities. Start your day earlier or later than the majority and take your breaks outside the busy lunch hours. Ps. and do not forget to buy comprehensive Ski Holiday Insurance as accidents can happen and risk of injuries tends to be highest among those that are still inexperienced skiers, i.e. children and beginners on the slopes.